If I build the one with the switch, then add another switch to jump over the cut in row D, will that act the same as the both channels jumpered option? The middle position of the switch is both channels jumpered. @zach These are all VERY cool! Thanks for doing them. Will these work as stand alone pedals if not used with class D amp? Thanks again! Definitely. Just it like an overdrive or run it in your effects loop so you bypass your amps preamp, basically making this the preamp to your amp. So... you just feed the output to your favorite mono amp board, then out to a nice guitar speaker, or two, or four, and BAM! ? is this the wiring for the amp itself or for a preamp pedal that is like the amp? Like could i build a cabinet, add a speaker and use it as an amp? This is just the preamp. So could I house this in a pedal and use it in place of an amp? Can I pair this with a tda7293 power amp module? with fx loop in between? Treble pots wired backwards changed it to 100k I also changed the Bass to 500k just wasn't much adjustability there, then again I am using cheap pots. Why would the switchable channel DPDT be On-On-On and not just On-On? Is it not just one channel or the other? You could blend both channels in the middle position of the DPDT. Ah that is cool! 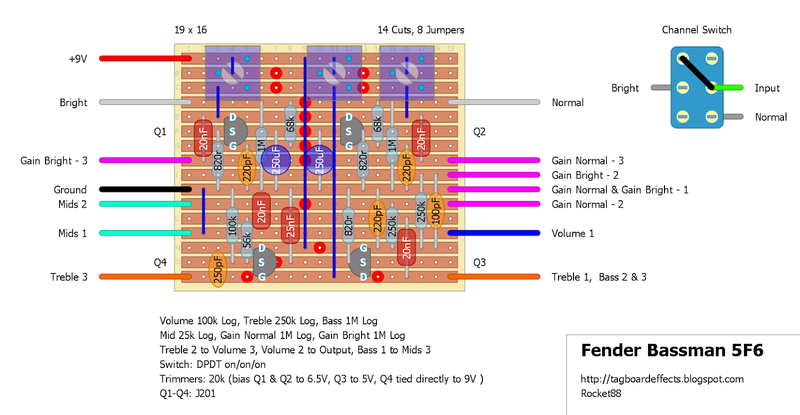 With the wires going to multiple pots, I guess I can just run a jumper between the different pot lugs, eg Treble 1 and Bass 2 and 3. What about the trimmer settings? What am I aiming for? I also don't really understand the switch wiring, but that could be my inexperience. 1. The Treble control is not working on my build. 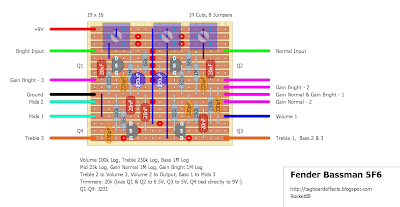 When I turn treble to max (to "treble 3") then I loose much output signal and the sound does not really seems to have more treble frequency. I've already checked for short circuits and also compared to schematics I have found on the internet. I do not find the error. 2. The general output of the preamp is very low. You have to set level to max and gain (bright/normal) to 3/4 to achive the same output as in bypass mode. 3. 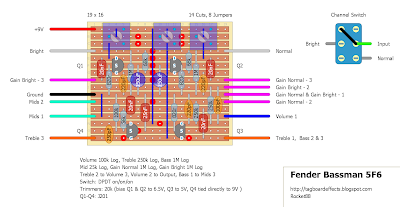 As I understand the schematic the 100pf should be located between "Gain Normal 2" and "3" but it isn't. Maybe someone could help me with this problems. The main problem was, that I had connected it directly to a passive DI with speaker emulation. Because of the construction of the circuit this is a hughe problem. The circuit is build to go directly from tone control to output and in that case the input impedance of the next stage affects the tone control. If you want to build this preamp I would recommend to add a buffer to the circuit or, even better, a booster if you want to run it without distortion. I've seen that Zach has modified the bright and normal channel so my point 3. isn't relevant. perhaps a dumb question but should I put the booster before or after the preamp? My guess, after, but I'd like to be sure. BTW, what are your trim settings? Yes, after the preamp. 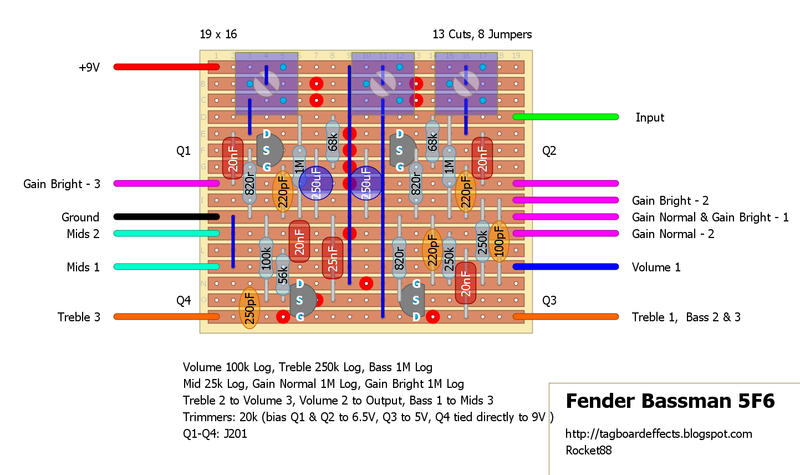 If your booster has a fixed boost you can connect the input of the booster to Treble pot lug 2 and the output of the booster then to the Volume pot lug 3. That 100pF still has to be moved? or is the layout correct? Wat booster did you user? I was thinking about the BBE boosta Grande. I've build the booster/buffer a long time ago and do not have the source anymore. 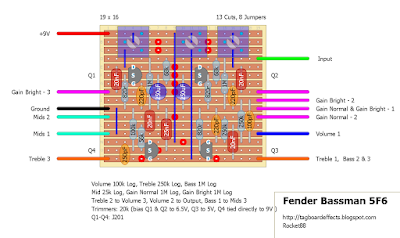 I think it was based on the schematic on page 19 https://www.tonefiend.com//wp-content/uploads/DIY%20Club%20Project%203%20v02.pdf. The BBE boosta Grande should work fine I think. Any linear buffer will work. so would you call it verified? or is that booster part mandatory? perhaps it can be added on the layout? I have to clear up some miss information that's been posted recently. There is no need for a booster after this circuit. If built properly and used properly it will work as intended. Keep in mind, this is a conversion of a the tube preamp to use FETs. You need to make sure the FETs are biased correctly. The interaction with the DI mentioned above seems really odd to me, because people have used the other preamps that are similar without issue. This leads me to believe that either the DI used has a specific input impedance or there's something wrong with the build. I've uploaded corrected layouts with the suggested FET voltage biases and a different value bias trimmers that will be less finicky to allow for easier bias. Also, I marked it verified because I've built the other preamp layouts which are identical aside from value differences due to being from different amps. I recently bought myself a tiny mono power amp board with the TPA3118 and i intend to build this preamp soon to go along with that power amp. 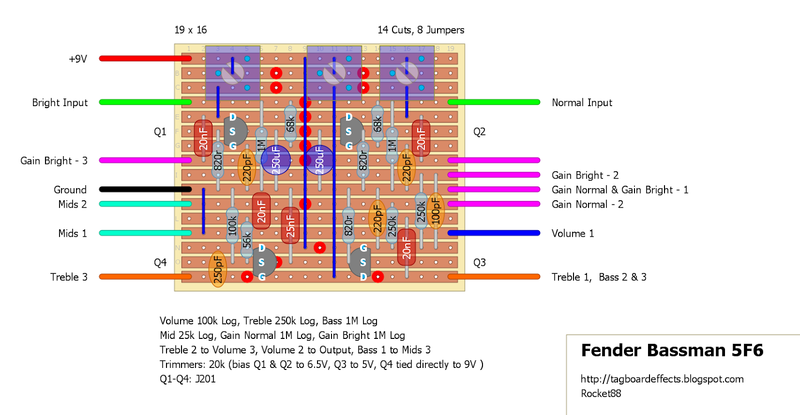 Since you mentioning working with class D amps would you say output impedance is sufficient? would it work? You’ll have no issues. Many of us have done the same thing with mono power amp boards like that. Two things to keep in mind. To get the most out of the power amp you want to run it at 24V. Second the speaker impedance will affect the output. If I’m not mistaken, those boards have max output wattage with 2ohm speaker impedance, so anything more than that will have lower output. thats nice! id love to see some demos. alright i imagined that about the voltage as initialy i was thinking about 12v battery. perhaps with a charge pump just for the power amp board up to 24v would do the trick? If thats the case it will be really hard to find a proper 2ohm guitar speaker. any ideas? but then perhaps this is all wrong. i'll have to read the datasheet of the TPA3118. Then the max output would be at 4ohm. I couldn’t remember if it was 2ohm or 4ohm. I would go with what is stated in the auction. As for getting 24V, you can do a charge pump, I posted on here that will take 9V and bump it to 24V, or you can use a 24V power supply. I would go for a 24V power supply because you need enough amperage to power everything, preamp and amp. I don’t have any demos of a build with this preamp, but I posted on of the Mini Sunn Model T I build. What would you say is the average requested amperage for such combo? Ill take a look on your charge pump and sunn model t build. Again thank you so much for all the work you'r providing us! I didn’t use a charge pump in mine. I have a dedicated 24V powering the board. I run 6A in, which is more than enough.